Meet October’s Crew of the month, Susan Blair! Susan has been a part of RCMSAR Station 12 for just over three years and is a dedicated member of our crew. 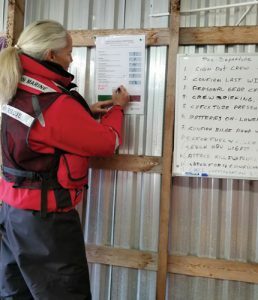 Susan has attained her Crew level certification and is a positive and supporting member both on and off the boat. She is a proficient navigator and often assists new members with basic navigation skills. She has taken the SARnav-1 course at RCMSAR Headquarters and hopes to attend more courses in the future with RCMSAR. Susan has dedicated almost 170 hours of sea time and 575 total hours over three years to our station. She has been on 14 missions overall and is a big support behind the scenes as well! Susan is part of our management and leadership team as station operations assistant – she is our administrative officer and takes care of organizing events such as the recruiting drive and the Polar Bear swim. Susan ran a very successful recruiting drive this year that saw us gain eight new crew and three new supporting members. In the non SAR world, Susan works for Vancouver Coastal Health at Sechelt Hospital as a Certified Pharmacy Technician. Bravo Zulu, Susan! You are an inspiration to women on the water!! Please join us in celebrating our crew highlight of the month who has been with RCMSAR Station 12 for almost 3 years. Since joining our team Erin has managed to volunteer over 1000 hours of service. 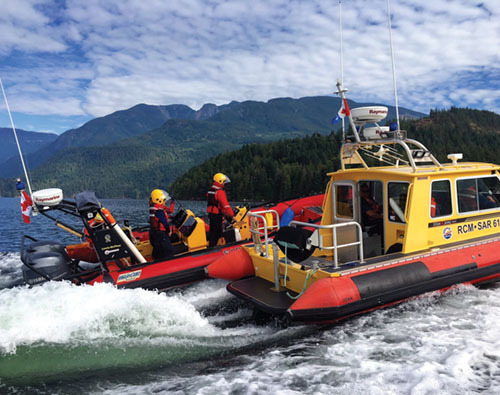 She has recently completed the Rigid Hull Inflatable Operators Training with the Canadian Coast Guard in Bamfield newly promoting her into a Coxswain position at Station 12. Erin began her journey with Station 12 almost 3 years ago where she quickly found her passion in team building and training others. Erin is happiest when passing on her love of the Collision Regulations. She has kept our training program on track for 2 years, always innovating and developing new strategies. Her energy and enthusiasm is contagious and Station 12 is grateful to have her on the team. Erin can be found jogging through the woods, fishing in Porpoise Bay for Dungeness crab or generally enjoying everything the Sunshine Coast has to offer. She is an avid sailor and traveler, a free spirit who is always searching for new ways to improve herself. In her professional life Erin works for Praxis Performance Group as their Program Facilitator. As the new year begins and resolutions are tested, here are 10 essential Items (from North Shore SAR) for ensuring your safety during winter adventures and outdoor treks. Always tell a reliable person where you are going and when you expect to be back, leave a detailed trip itinerary and make sure you know your route. Flashlight or a headlamp with extra batteries (and light bulb if not LED). Green cyalume stick or small turtle lights as emergency backup. The lack of light is the single most common cause of over-due hiker calls for SAR. Whistle (we recommend the Fox 40 whistle with a lanyard), Bear Bangers, Pencil Flare. Why a whistle? It is ideal for signalling for help as your voice will become very hoarse in a short period of time especially if you are dehydrated. We recommend the Fox 40 whistle because it works very well in wet conditions and has good range. Matches (water proof or in plastic bag) or lighter. We also recommend a commercial firestarter and/or a candle. Commercial firestarters can be purchased at outdoor or hardware stores. Hat, gloves or mittens, fleece jacket, Gortex jacket, polypro underwear, good quality hiking socks and Gortex over-pants. Large orange plastic bag and thermal tarp. Why a large orange plastic bag? It’s actually one of the most valuable items on the list. Crawling into the bag helps keep you warm and dry. The orange colour is also highly visible and helps attract attention, particularly from the air. We recommend you bring a cell phone with a fully charged battery. It is advisable to keep the phone turned off, and stored in a ziplock bag. This way, if you get into trouble your phone will be dry and have a full charge. Many people manage to call 911 initially but their phone dies before their location can be relayed, not a desirable situation. Remember, electronics can fail, run out of batteries, or lose their signal. Telling someone where you are going, leaving a trip itinerary and bringing the essentials is critical to a safe outdoor excursion. Please join us in congratulating our crew member of the month who has been with RCMSAR Station 12 for 4 years! Tonya started her journey as a supporting member spending countless hours at events such as the Sechelt Night market and numerous fundraising en devours. 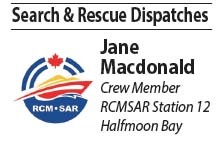 She was an integral part of the fundraising team helping us promote boating safety as well as the RCMSAR brand. Her contagious smile, passion for the sea and willingness to help others always attracts a positive public response to our cause. One year ago she became an active SAR team member quickly dominating our new crew, crew level and advanced crew training programs. She has since become lead with our social media program developing a series of boating safety videos that have been well received by our followers. Tonya has increased our online presence exponentially, her dedication displayed in every aspect of involvement with our station. Recently she has completed the first ever Coxswain Leadership 1 course facilitated at our regional training facility in Sooke BC. Graduating with top marks she will be an excellent asset to the leadership team at Station 12. Tonya works for the Sunshine Coast Community Services as a youth care worker. She has deep roots in our community and an impressive commitment to helping young adults. Some of her spare time is spent teaching youth to sail at the YMCA camp Elphinstone in the summer months. Completing the return journey of the Victoria to Maui sailing race last summer she can usually be found racing in the many other competitions held on the Sailish Sea. The ocean courses through her veins, her free spirit, adventuresome attitude and maritime experience make her a natural leader. RCMSAR Station 12 is grateful for her commitment and involvement.